I am delighted to announce that my book – Remember Everything You Want and Manage the Rest – has been launched on Amazon Kindle. 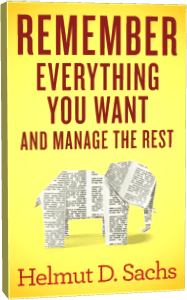 UPDATE, Thursday, May 12: Remember Everything You Want and Manage the Rest (version 1.1) is available on Amazon. This is the time to read it! What is this book is all about? It is a no-nonsense guide for anyone who wishes to improve their memory and learning and acquire powerful techniques and tools to organize information from all kinds of sources. It merges highly effective learning and memory improvement techniques with information and knowledge management to provide a complete solution for students, professionals, and life-long learners. The techniques are accompanied by easy-to-follow examples. Many memory books claim, “You are only using 10% of your brain.” “Create a memory palace and multiply your brainpower.” Yes – mnemonic techniques work and are fascinating. You can use them to memorize a large number of facts or foreign language vocabulary fast and with confidence. They allow you to give a speech to the point completely from memory. Mnemonics are a real time saver, so we cover the most effective memory improvement techniques and accompany them with easy-to-follow examples. But contrary to what some people might claim, you will forget a large part of this information after a relatively short time if you don’t use it. This is just how the brain works. You have to reinforce what you want to keep. Did you know that you have to spend about 50% of your learning time practicing recall to create a reliable long-term memory? And you have to do this over time. We take an in-depth look at the most powerful memory technique of all – Reviewing by practicing recall using effective methods and modern computer software. These days an enormous amount of information is available on the Internet, in databases, and in huge libraries. A lot of this information will be outdated in a few years. You’d better not “store” everything in your brain. Remember, you need a considerable time to keep the information there. Most of it you shouldn’t even download to your computer or smartphone. This book shows you how to extract the important information and organize what is relevant for your business, research, or studies, so that you can re-find it with ease while it is relevant. We introduce smart and mostly free computer applications allowing you to distill and manage information from all kinds of sources with the click of a few buttons. Highly effective memory improvement techniques: Learn and review faster, pass exams, memorize foreign language vocabulary with confidence, and improve your memory in all areas of your life. Methods and mostly free computer software to distill, organize, and review information from all kinds of sources. How to re-find your information with ease, build your personal digital library, and create bibliographies for your own writing by clicking only a few buttons. How to take and manage notes in innovative ways, including techniques such as mind mapping and outlining. 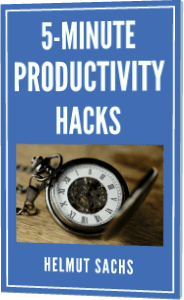 How to improve your attention span and concentration and beat absentmindedness and stress. If you like what you are reading, check out Remember Everything You Want and Manage the Rest on Amazon. If you don’t have a Kindle, you can still read this book. In fact, I think it looks great in the Kindle App. Just download the Amazon Kindle App, which is available for PC, Mac, iPhone, iPad, Android, Windows Phone, and Blackberry. This entry was posted in News by Helmut. Bookmark the permalink.